What is Cascara — Slingshot Coffee Co. While it’s no mystery to most what coffee is, we thought we’d drop some knowledge about Cascara. So… what is Cascara? Good question. It’s awesome. Coffee beans are the seed of a fruit, commonly referred to as a coffee cherry. This small, fleshy fruit can vary in color based on its variety, but is most often yellow or red when ripe. The cherry itself contains caffeine (that’s how coffee gets its caffeine) and is rich in antioxidants. The fruit protects its seeds as they grow and develop by deterring insects and other wildlife that could prevent the development of the seed. Few coffee farmers produce high-quality Cascara and even fewer export it. At Slingshot Coffee Co., we partner exclusively with world renowned Specialty Coffee producer, Aida Batlle – a fifth-generation coffee farmer and the first ever producer of Cascara in Latin America – to directly source single-origin and single-variety Cascara from Finca Kilimanjaro, a Cup of Excellence Award-winning farm in Santa Ana El Salvador. Aida began drying coffee cherries more than 10 years ago and continues to produce some of the most highly-sought-after Cascara in the world. At the farm-level, Cascara requires the same attention to detail in processing as coffee, and there is a spectrum of quality that ranges among farmers who produce it. Coffee cherries that have been meticulously grown, picked, produced and dried will ultimately lead to a better beverage when properly brewed. 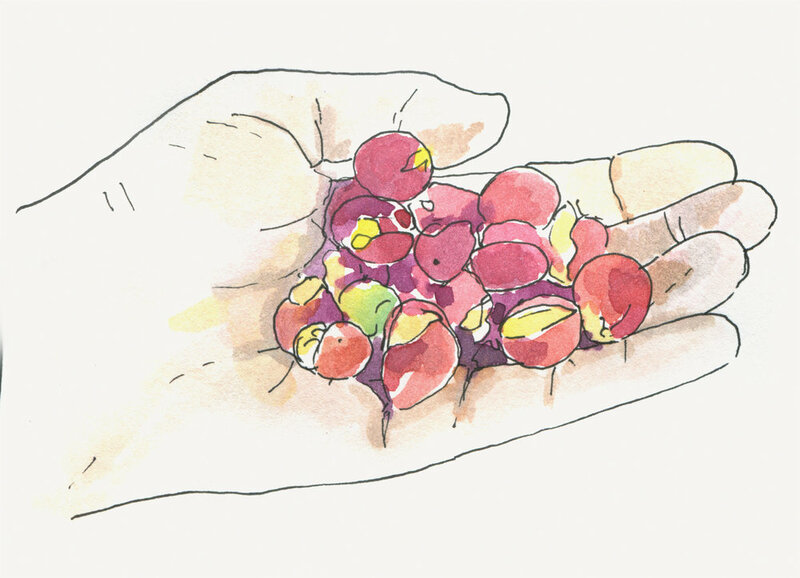 At Finca Kilimanjaro, coffee cherries are separated from the seeds and left whole. The whole cherries are washed clean, which removes some additional pulp from the husk. The cherries are then sent to dry on raised beds before being packaged for shipment. Although it comes from the coffee plant, Cascara tastes nothing like coffee when brewed. Because it’s brewed from a dried fruit, it most closely relates to an herbal tea or tisane. The variety of the coffee cherry – in addition to where it’s grown, when it’s picked and how it’s processed – has a strong influence on flavor profile, body and acidity. Typically, there is a naturally sweet component to the flavor profile that may be complimented by a tangy or floral component. How it’s brewed also plays a role in what flavors are most pronounced, as well as the body and acidy that is most present. When we introduced Cascara Tea in 2013, we knew it might be a head scratcher. While still a fairly new introduction to the United States, it's an exciting piece of the Specialty Coffee experience. Brewed hot or cold, Cascara is a super interesting way to enjoy another delicious part of a plant of which we have all grown quite fond. in 2018, we're thrilled to introduce two new Cascara Tea flavors — Blueberry Jasmine and Cascarnold (our take on a classic iced tea + lemonade blend) — to our Cascara Tea family. These recipes were built from the ground up using the best all-natural ingredients. Each flavor is slightly sweetened with only natural cane sugar and real fruit juice. And with superfood qualities, it'll be your go-to for a little boost and a lot of good vibes.